Beverages are not as satisfying as solid foods and typically don’t compensate for eating a balanced nutritious meal. According to research, our brains register liquid calories differently than calories from eating solid foods. 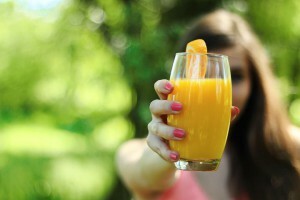 Orange juice (for example) is naturally high in calories and sugar. An 8 ounce glass of OJ typically has 130 calories. When you consume the juice, your brain won’t register the calories the same way it does if you eat an actual orange. Researchers believe this is because the action of chewing and biting isn’t present which may trigger signals in the brain that we are eating. You may also find you don’t feel as full from a glass of juice as you would if you ate the orange in its natural form. Why is this? Because the orange fruit has fiber and the juice has very little fiber. Fiber helps us feel full and contributes to proper digestion. Juice, which is mostly sugar, is quickly absorbed after we drink it. It’s okay to drink milk, juices, and other drinks in moderation. But try to stick to non-caloric drinks like tea, coffee (skip the creamer), and water. If you need to liven up your water, try a squeeze of lemon or lime to give it a fruity kick. If you consume alcoholic beverages, be mindful of the calories. Hope this helps you live a healthy Skinny Life!